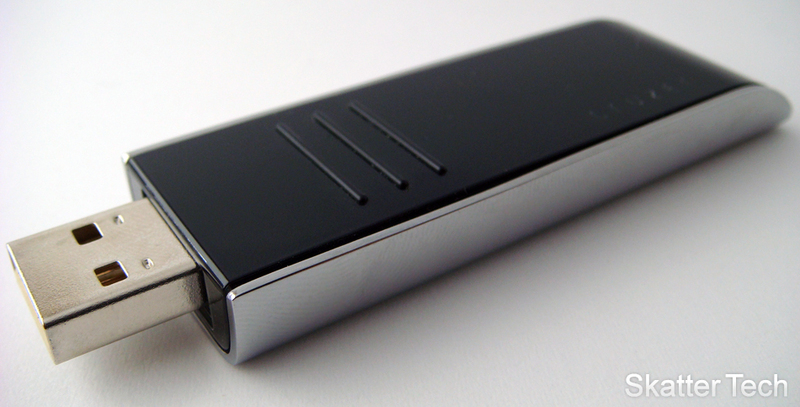 The flash drive market today has been infiltrated by cheaply manufactured devices which offer large amounts of storage space, however most of these are not reliable for storing important data. As a result brand name companies such as SanDisk still produce high end flash drives that have high quality memory and offer fast read and write speeds. The SanDisk Cruzer Contour, which I would like to thank SanDisk for providing for review, is a great example of one of these premium drives. The Cruzer Contour supports AES hardware encryption, has a sliding USB mechanism (see video demo), is Windows Vista ReadyBoost verified, and includes a selection of pre-installed U3 Smart Apps. The Cruzer Contour is a bit heavier than most flash drives, but this is due to the aluminum encased back-side. The top front was made of glossy plastic, which unfortunately had a “cheap” feel to it. To open the drive, you’ll have to slide it backwards then forwards. To close it, you’ll have to slide the top forward then back. Overall the build quality was superb. It isn’t an IronKey, but it is more than enough for the average consumer. I also personally felt that this looks much better than most flash drives I’ve seen. The only other physical caveat I had was that the “cheap” plastic on top kept creaking when opening and closing the flash drive. I also appreciated the fact that SanDisk threw in a leather protective case with a key chain loop along with the flash drive. The whole package looks “executive” enough for me. As I mentioned previously, the unit’s performance is an important factor. SanDisk officially stated that the drive has 25 MB/sec read speeds and 18 MB/sec write speeds. I used a benchmarking tool (HD Tune) and found that the transfer rate was actually 22.1 MB/sec, about 4 MB/sec faster than they had stated. The read and write speeds were sure enough much faster than generic SanDisk Cruzer Micro I had lying around, but was on par with the IronKey. SanDisk included a set of U3 applications on the drive, these included: Avast! Anti-Virus, Skype, HP Photosmart, some games, and a password manager. I wasn’t a fan of the idea of the launcher starting up each time I plug in the drive nor to have applications I don’t plan on using on my flash drive. As a result I downloaded and ran the U3 uninstaller, which I was able to easily find on SanDisk’s website. All traces of the launcher and applications were quickly erased leaving me with space for my data and media. Keeping the U3 apps would allow me to encrypt the drive, however the downside would be that I would only access my data on a Windows-based machine, no OS X support. Despite that, from some quick tests proved that the default security was quite robust. The partition on the flash drive with encrypted data was completely inaccessible without the correct password. 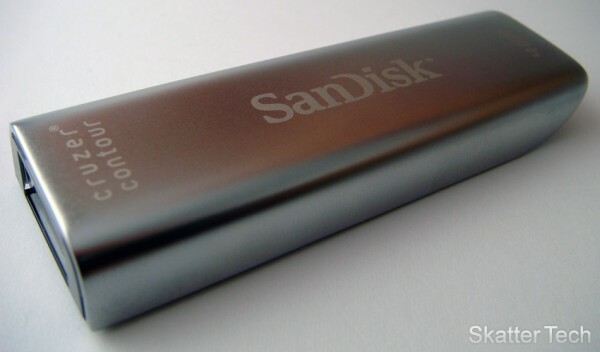 Overall all the entire idea of the SanDisk Cruzer Contour deserves a thumbs up. Although I happened to not be a fan of the pre-installed apps since I preferred to use my own tools and encrypt my data with TrueCrypt, most consumers will appreciate it. As for the unit’s lifespan, I won’t be able to say how long the flash drive will survive under standard wear and tear, however I would assume it will keep running much longer than cheap generic flash drives. Fortunately it comes with a lifetime warranty, however that won’t cover any data lost due to defects. As for the physical aspect, I found the opening and closing to be a bit tricky at first and is a bit difficult to operate with one hand, however it isn’t an issue after a couple of uses. The unit I reviewed had 4GB storage capacity, however SanDisk also has 8GB and 16GB models available. The drives are available for purchase for as low as $43 for 4GB, $55 for 8GB, and $112 for 16GB on Amazon, however MSRP is much higher for each of the models. It seems you have a grammatical error. I thought i would point it out. Anyway looks like a pretty sweet device. I think i am going to go drop by fry’s and get this. i had a sony microvault, but after going through the wash a couple of times, it kinda died. it works sometimes, but just stops transfering before finishing th file. i need a new one soon. also do u know if this has a firewall too? slick package – totally useless, no – garbage is a better word. I can’t even plug it into the port without it sliding back into the case like a scared turtle. It just does not work I highly recommend looking for another drive!!! Hmm, I definitely didn’t have that issue at all. Once it slid out of the case it locked into position quite well. It is possible that a lot of wear and tear might have loosened up the mechanism. But if your drive is fairly new, I would suggest contacting SanDisk, they will probably replace the unit if it is defective! But what you say happened to you shouldn’t be happening at all!!! Hopefully not a widespread issue. It is NOT a “leather” protective case. 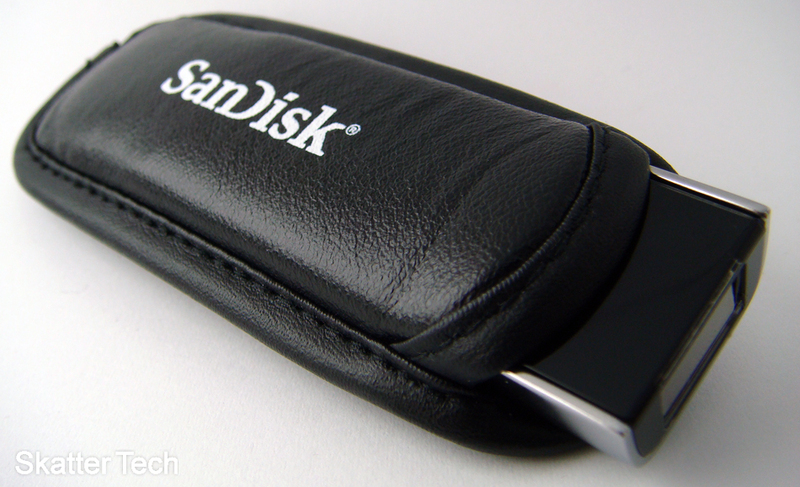 It is the cheapest of the cheap vinyl case with a white screened SanDisk logo (which will wear off in two weeks). The drive speed, however, is remarkable and I am very pleased with that aspect of it. The sliding mechanism went from fairly hard to operate with one hand (because of it’s stiffness) to practically needing a c-clamp to hold it closed. (I am not pleased at all with that.) I, too, use a Mac so the offending pre installed software had to go. You can not delete the U# partition on a Mac, however, and would need a Windows machine to do that for you. I would recommend it for the speed if you are able to deal with the disappointments I mentioned. My U3 flash drive is now inaccessible and requires that I erase all data before I can use it again. Is there a way to regain access? i see your post back in May about your U3 flash drive. I have the same problem, drive is inaccessible. did you found a way to resolve this? Please let me know.